Product #25885 | SKU 3059Z00240 | 0.0 (no ratings yet) Thanks for your rating! The matched pair of C414 XLII ST Multi-Pattern Large-Diaphragm Condenser Microphones from AKG is a staple within the audio industry. Equipped with nine selectable polar patterns, three attenuation levels and three switchable bass-cut filters, the C414 XLII remains one of the most versatile condenser microphones for recording vocals, drums, and acoustic & amplified instruments in the studio or on stage. This microphone closely approximates the sound of the legendary AKG C12. A slight high-frequency rise at 3 kHz and above helps compensate for the natural loss of high frequencies that occurs at a distance, making the C414 XLII an excellent choice for miking vocals & instruments that are positioned far way. The 1" edge-terminated dual-diaphragm transducer combined with the low-noise electronic circuitry provide a wide dynamic range of 134 dB and can handle SPL up to 158 dB, for a neutral and detailed sound. Features include a peak-hold LED to alert you if overload peaks occur, and a Lock Mode so the microphone settings cannot be changed unintentionally. The elastic capsule suspension minimises structurally-transmitted noise from chassis vibration. The rugged all-metal body ensures efficient rejection of RF interference and makes this microphone well suited to withstand the rigours of studio and stage handling. 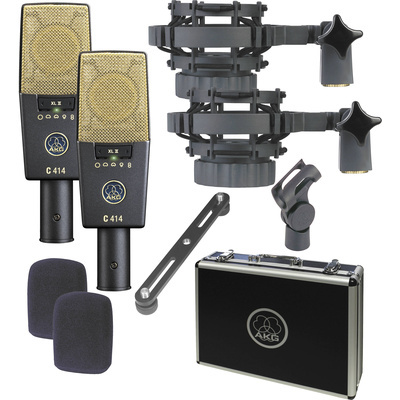 Every factory-matched pair of C414 XLII is created from microphones selected by AKG's computer-aided matching method and provides the highest possible correlation over the microphones' entire frequency range, as well as virtually identical sensitivity for natural three-dimensional stereo recordings. Built and designed in Austria, the set comes with a metal carrying case, two spider-type shockmounts, two stand adapters, two foam windscreens, and a stereo bar.